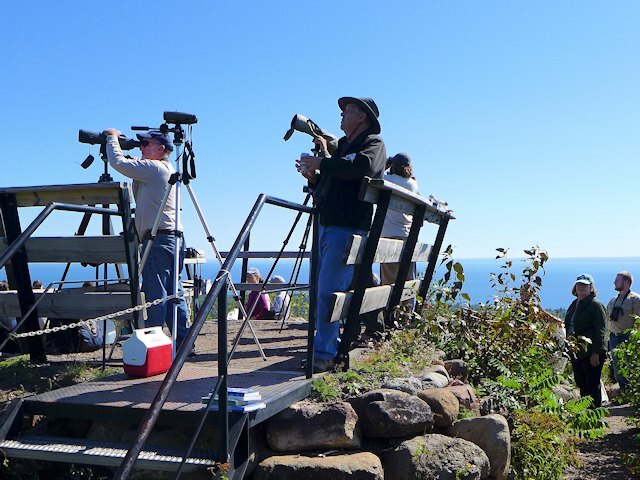 Located near the Northeast end of Duluth's skyline parkway, Hawk Ridge is a favorite haunt of bird watchers and hikers August through November. 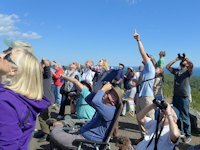 Raptor migration begins in August and accelerates when the weather begins to cool in September. 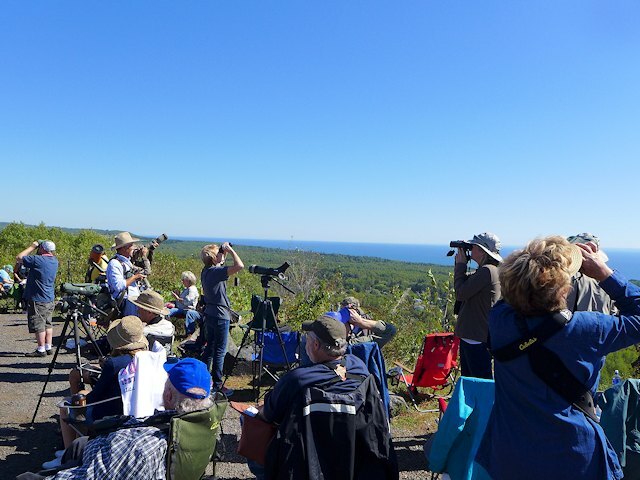 The "Friends of Hawk Ridge" sponsor Hawk Weekend and daily naturalist programs in September and October. 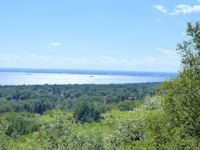 < < < The main overlook is located along skyline parkway and requires no climbing or hiking. Pictures below. 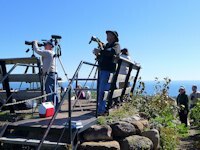 Using high powered spotting scopes and a trained eye, a team of trained volunteers maintains the official raptor migratory bird count from an observation deck. Volunteers with the Friends of Hawk Ridge sponsor workshops, field trips, and demonstrations on raptors and raptor migration. 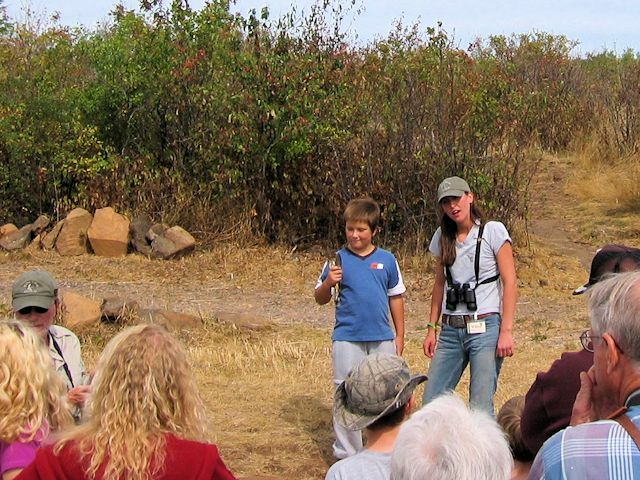 < < < A volunteer naturalist shows off a Kestrel, a small falcon, also known as Sparrow Hawk. Three banded raptors were demonstrated and released the afternoon we were there. Kids in the audience are given an opportunity to hold a small raptor before release. 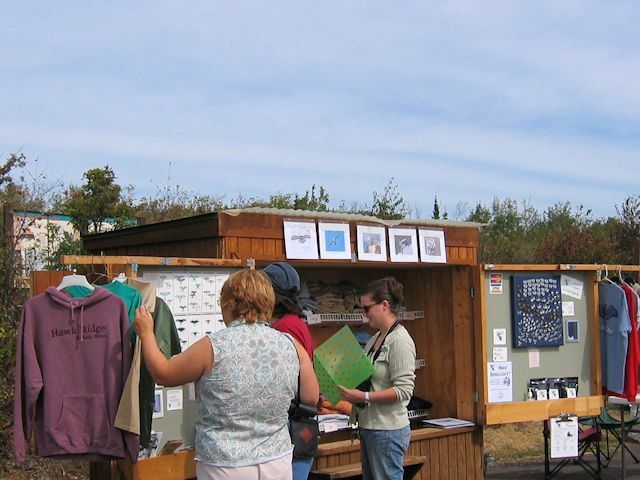 The Friends of Hawk Ridge booth offers merchandise and informative literature of interest to bird watchers. < < < The most birds are seen in September. 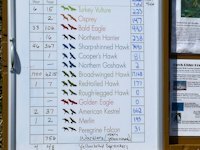 October offers the most diversity and November features more Eagles and other Big Raptors. 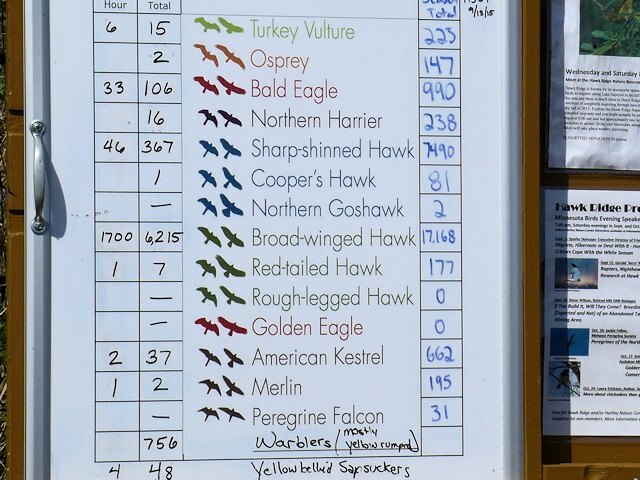 The picture to the left has a table showing the typical migration times of different raptors. Map of Hawk's Ridge Hiking Trails and spur trails that connect with the Superior Hiking Trail. 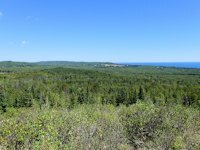 Looking North and South from Hawk's Ridge Summit Ledges. The normal entrance to Hawk's Ridge is via Skyline Drive. 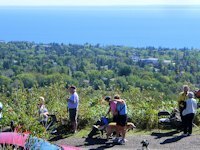 While many vehicles return along the same route, a nice alternative is to continue driving east connecting with Seven Bridges Road to return to Duluth proper that way. Go here for a map of this route and photos of four of the historic seven bridges. 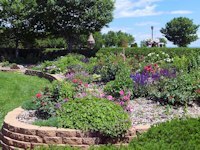 And you can see more photographs of this drive and its scenic bridges an an interesting website on the history of the Seven Bridges Parkway created by Mark Ryan.